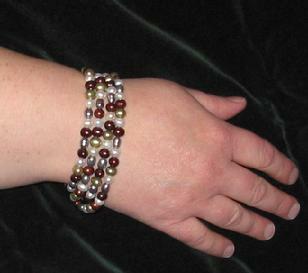 This bracelet is a reproduction late Elizabethan bracelet made from freshwater pearls. The source for this bracelet are the bracelets shown on the wrists of Queen Elizabeth I in the 1590 portrait owned by Jesus College at Oxford. This portrait is found on page XVIII in Queen Elizabeth’s Wardrobe Unlock’d by Janet Arnold. The bracelet could be made from agate, jasper or pearls, all of which were in period at the time. Pearls are a ubiquitous item found in 16th-century portraits. Agate and jasper are referenced in “A Middle English Lapidary” edited by Arne Zettersten. I chose to make the bracelet from freshwater pearls because when strung, they reproduced the look of the bracelets shown in the portrait. Though a modern bracelet like this would be created with a clasp, I saw no clasps on bracelets shown in portrait. It is entirely possible that Queen Elizabeth simply looped a necklace-length strand of pearls around each wrist. Therefore, I strung the pearls on a silk cord which can be wrapped around the wearer’s wrist.